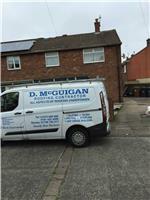 D.McGuigan Roofing Contractors - Fascia/Soffits/Guttering, Roofer, Windows/Doors/Conservatories based in Lynemouth, Northumberland. D.McGuigan Roofing contractors are a family run professional roofing company based in Northumberland with years of experience in the trade. All our work is carried out to a high standard and customer satisfaction. Anything from a single cracked tile to a complete new roof we can help.